Heat oven to 375°F. Add pineapple to small bowl. Core, seed and thinly slice 1 jalapeño chile into 12 slices; reserve. Core, seed and finely chop remaining jalapeño chile (about 3 tablespoons), and add to pineapple with honey; stir to completely mix. Slice sheet of dinner rolls in half horizontally; place bottom half in ungreased 13x9-inch (3-quart) baking dish. Place 4 slices of cheese on bottom half of rolls. Mound ham on each roll bottom. Spoon pineapple mixture over ham; top with remaining cheese. Place top half of rolls over cheese. Brush melted butter over top of rolls; place one jalapeño slice on top of each roll. Bake 19 to 22 minutes or until rolls are deep golden brown and cheese is melted. Cut into individual sliders, and serve. 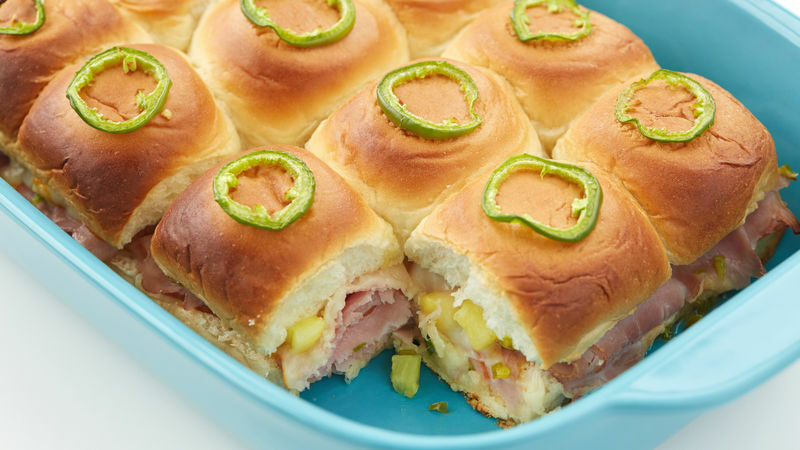 King’s Hawaiian™ original Hawaiian sweet rolls (12-oz package) are the perfect choice for this recipe. Black Forest and Tavern ham are both a smoked style of ham. Other deli hams are typically dry cured and have a slightly different texture.